“One is the loneliest number that you’ll ever do Two can be as bad as one It’s the loneliest number since the number one…” oh how Three Dog Night knew how to ‘bring it’! Their song, One(Is The Loneliest Number) was actually written by Harry Nilsson, but reached Number 5 on the Hot 100 back in 1969! It’s as classic as rock gets and even today–you can listen to it and forget that it’s 2013—you may think it’s 1973! Why bring that up tonight? Well, it’s really kind of strange, but one is the loneliest number but for our purposes, 1-1-0 is the loneliest number. Yep. . .we have exactly 110 days to go on our wine blog and we’re struggling to find wines that fit our profile; have a decent taste and are wines that can be found in most shops around the country. Clearly, there are an amazing number of wines available in the price range under $20 a bottle. The catch is that some of these vintages are superb and others are sub-par. We LOVE to find wines under $15-$20 a bottle that rock the house. . .you know, big-bold wines that just reek of flavor! Yep, that’s our “One”…but we’re still searching for THE ONE and probably will continue searching for the next 110 days! To help break through to the final level, tonight we opened and tasted a 2011 Finca el Origen Rieserva Malbec and we have to tell you that this is a gem. Yes, it’s young, but most Malbecs are better young and have the chops to stand up to food where others are just too thing to offer any flavor! This wine has an attractive and intense violet color. On the nose, it displays ripe red fruit aromas, such as plum, with a strong floral presence, combined with vanilla and chocolate hints granted by its oak aging. In the mouth, it is a mild wine with sweet and velvety tannins. It has good balance, elegance and personality. In short, this wine rocks! 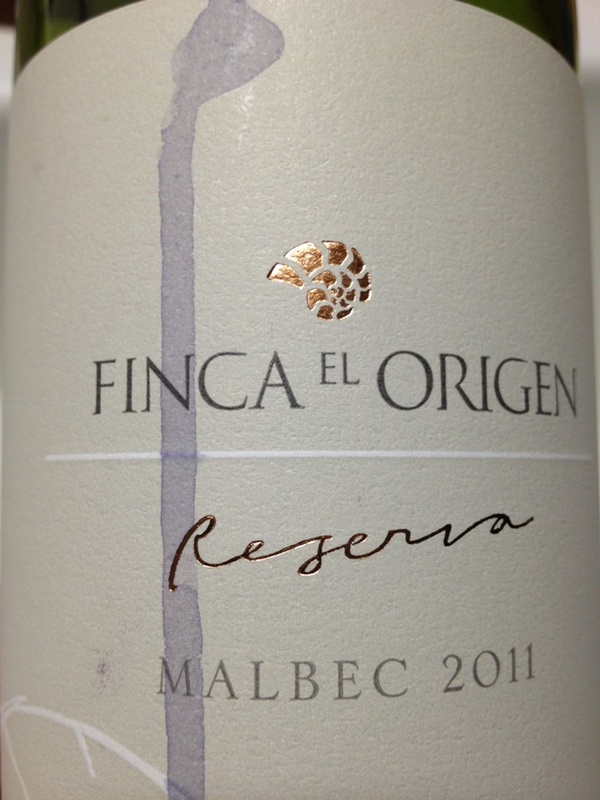 Yep, we could try and taste a huge number of Malbecs from this region in Argentina, but the Finca el Origen Riserva is the right wine at this moment in time! The lineage of this wine is impressive–past vintages have scored from 91 to 93 points and continue to gain value as time moves on! Sight: This wine has an attractive and intense violet color. Nose: In the nose, it displays ripe red fruit aromas, such as plum, with a strong floral presence, combined with vanilla and chocolate hints granted by it soak aging. Mouth: In the mouth, it is a mild wine with sweet and velvety tannins. It has good balance, elegance and personality. Recommended wine for pairing with game, hard cheeses, pasta, empanadas (meat pies). And at right around, $10 a bottle, this wine is a huge benefit to those on a budget; we’re going to this bottle of wine. All in all a nice wine for the price…once again, under $12 a bottle….and ready to enjoy today. Speaking of this, please remember to taste and enjoy your favorite wine responsibly and recycle whenever possible.